Thanks to Linda Rader (LIS) for this note. Reblooming irises are a pleasant addition to the autumn garden, if you can get them to rebloom. We’ve had only minimal success in the past. Stalks shoot up in late September; but, cool nights stall the blooming process and the buds just sit there. 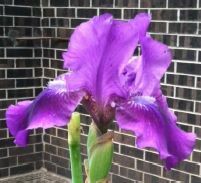 A frequent exception to this is Connell Marsh’s ‘Constant Companion‘, an intermediate bearded iris, about 18″ tall, introduced in 1995 by the Marsh’s garden, Iristocrat Acres. This year in our garden it has a stalk with two branches, a spur and seven buds! A very welcome surprise! This entry was posted in Uncategorized and tagged irises by wrmesser. Bookmark the permalink.